A Tree House for You and Me…. I loved your shamrock pattern – if only I didn’t have something already on the needles. This week I’ve written a post about what to look for when Op shopping. Happy Friday everyone! Daylight savings on Sunday for those of us in the USA! Whoo hoo…..more daylight hours! I just love the new Meerkat pattern. You are so clever! Wow, that treehouse is AWESOME! And the meerkat is sooo cute! So this is my first link up….very exciting! I need some help/ideas about my very, very cool quilting project. I hope I get some feedback. 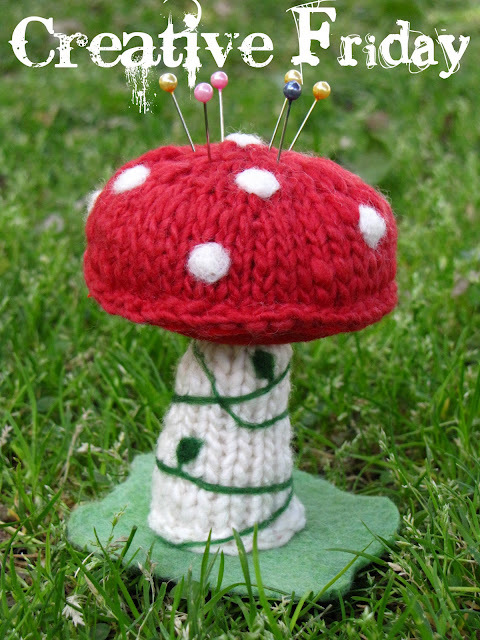 :) And, btw…that’s the sweetest little pincushion I’ve ever seen! Hoping to add knitting your apple cozy pattern to my list of to-dos! Think it would be a wonderful gift for my little’s teachers. Thank you for sharing it! Busy day keeping up with the farm today but I squeaked one in at the last minute 😉 Thanks for allowing us all to share!